The Nikon S2 was the top camera of its time in terms of performance. But much more than that, it was distinguished by its "nimbleness" — it epitomized small-camera mobility. The S2 is no match for modern built-in motor drive cameras. However, when it comes to snapshooting, the S2 holds its own in comparison to modern cameras. It can be said that the S2 represented the greatest improvement in handling of any model that was released as a successor to another. In this issue, we'll retrace the development of the S2 to see just how this great leap was made. The S2's predecessors — the Nikon S — becames "legends" thanks to the superior quality of their lenses and their durability. Although the camera generally received high praise, frequent users emphatically claimed that "the viewfinder was difficult to see" and the camera was "heavy". Nippon Kogaku was experiencing trouble of its own, as mass production of the S did not move as quickly as had been anticipated. Thus, achieving higher performance while at the same time solving other problems were the main goals in the development of the successor to the S.
And though it may have appeared as though the new model was a simple stepped-up version of its predecessor, more than a few detours had to be made along the way. The shape and the flange back of the mount used with the Nikon Camera (Nikon I), Nikon M, and Nikon S (we'll call it the "S-mount") was the same as the one used with the rangefinder Contax. But the coupling standard of the rangefinder was Nikon's original, applied to Leica's 5cm normal lens. The reason for this will be explained in a next issue when we discuss the development of the Nikon Camera (Nikon I), so we will set this topic aside for now. The newest camera in the series inherited this mount problem from its predecessors. But the answer was not to adapt a totally new mount. It was a matter of adapting Leica's M39 screw mount (we'll call it the "L-mount"), rather than the Nikon S mount, because of the L-mount's superior versatility. The number of L-mount Nikkor lenses produced was about the same as that of the S-mount, so all that remained was to develop the camera body. It was a plan clearly worth adapting. The fact that at least 2 versions of the L-mount prototype were developed is proof that this debate actually took place. A number of problems surfaced, but in the end the idea of emphasizing lens interchangeability won out, and the S-mount was chosen to be a part of the new camera. Though the development of the S2 did begin as noted above, Nippon Kogaku's goals also included raising the quality of the viewfinder, reducing the weight of the camera, enlarged film image size, improvement in shutter/flash synchronization, and overall advances such as increased operational ease. The Nikon S's film image size was 24 x 34mm. The width was increased to approximately 36mm, bringing it close to the world standard. This increase meant that the focal plane shutter's effective width needed to be increased as well, which necessitated the redesigning of the entire shutter. The basic axle position of the S's original shutter was changed to ensure sufficient room for the new image size. Additionally, to maintain stability at a shutter speed of 1/1000 sec., travelling speed of shutter curtain was accelerated. With the increase in speed of shutter curtain came larger rebounds when the shutter stopped. As a result, the image became "chipped" and belt-shaped reexposuring was prone to occur. This is where the idea to employ a pendulum-type brake was conceived. When the shutter curtain is drawn, a "weight", which has the same mass as the curtain, hits and stops the curtain. You might have heard of this mechanism someplace else..... that's right, this mechanism is used in one portion of the Nikon F5's mirror-bounce protection. It is referred to as a "mirror balancer" in a Nikon F5 catalogue, as well as in articles that appeared in a technical guide. This terminology, however, is not altogether accurate. A more correct term would be "mass brake used for a mirror". The word "balancer" comes from the idea of a brake spindle which was designed with emphasis placed on weight balance, so that the brake would work exactly the same no matter the direction or position of the camera. This innovation, of course, found its way into the F5 following its success in the Nikon S2. The "flick" sound made when the shutter of S2 is released is made by this mechanism. Getting back to the topic... the improvement made in the flash was the use of "X-contact" for the electro-flash (now known as the Speedlight"). In addition, a plan was in the making for an standard sync system for various types of flash bulbs. The synchro-socket adopted a standard form, and a direct contact for the accessory shoe was made. The Reverced Galilean finder was the same, except for the addition of a bright frame. This made the image size frame clearer and sharper, and the picture area easier to distinguish. Also, since the finder magnification became approx. 0.9 x, viewability improved compared with the Nikon S's approx. 0.6 x. On top of this, the rangefinder's effective base length had been increased and the accuracy of distance measurement had been improved. Aluminum molding, passed over for use in the Nikon Camera (Nikon I), M, and S, was employed for the body. This new aluminum-alloy diecast, was adaptable thanks to significant advances in technology. The overall body was thinner and lighter than those of preceding cameras — it was comparable to sand molding. And the fact that very little mechanical processing was required made mass production that much easier. To speed up rewinding, they added a crank to the knob..... an advance, by the way, that had been demanded by users following the development of a sample. Compared to the Nikon S, the Nikon S2 represented improvements in all areas. All was going well, until an historic incident occurred in the camera world. The event occurred in April of 1954, at the "photokina" convention in Koln, West Germany. The new Leica camera, the M3, was on display. It had a bright, clear viewfinder on a sharp frame. The frame was compatible with large-sized bayonet mount lenses, and could be switched automatically. The parallax was automatically fixed depending on the shooting distance. The M3 provided a real-image rangefinder with a long effective base length, lever-winding (two-time winding, later changed to one-time), and a uniaxial shutter dial that didn't revolve — even after the shutter was released. To sum up, it was a focal-plane shutter camera with new ideas and a new design. More than the number of units this camera would sell (about 230,000 cameras were produced between 1954 and 1966), camera designers were all interested in its progressive style of development. Speaking fundamentally, the exterior interface was very different from conventional cameras. From an overall perspective, the meaning behind the new shutter and winding mechanism was very impressive. There were still more changes that needed to be made to the S2. The reverted Galilean finder needed to be completely redone, and the finder magnification became life-size, rather than 0.9x (to establish a difference from the Leica M3, which also had a 0.91x ratio). The subject is viewed as through a glass block free of refraction. Therefore, with both eyes open, the photographer could see a floating frame in a wide view. This is especially effective when taking moving subjects. A lever-type winding mechanism was employed (one-time winding). This new design did not change the gear structure of the knob-type — a very clever improvement — and this enabled a chopped winding action too. 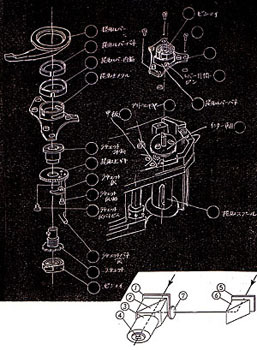 Though contrary to the S2's crank winding style, it was a well-balanced mechanism, as if it had been Nippon Kogaku's plan to incorporate it from the beginning of development. Improvements that followed these changes included higher performance (the initial goal), along with simplified operation and increased mobility. After 9 years of research, the S2 was released in December of 1954 — 8 months following the debut of the Leica M3. Its useful, high-performance camera body and the already-popular Nikkor lens helped make the S2 one of the most highly regarded cameras in the world. The actual value and the perceived value have both risen compared to the "Nikon S" era. With approximately 60,000 units sold, the S2 became the best-selling camera in the Nikon S series. The exterior design was so popular that other companies borrowed from the S2 for their own camera designs. Also, the S2 was so fundamentally sound that it became Nikon's base model, with many of its features visible in cameras prior to the F2. In terms of actual use, it saw action in a variety of situations ranging from severe conditions to taking a simple family picture. While all this was going on, a motor drive was developed for the S2, as was a bright lens similar to a 5cm f/1.1. The entire system had improved, helping to lead the way into the Nikon SP era. The shock caused by the release of the Leica M3 proved to have a positive effect on Nippon Kogaku and particularly the S2, which became a lightweight, high-performance camera. This camera is very "rhythmical" and crisp photography is possible. Some people say that the Leica had these characteristics, but there was a feeling surrounding the S2 that couldn't be found with any other camera. When compared with today's high-speed, high-class cameras, is this writer alone in feeling that a high-class camera needs a special quality that gives it its own identity ?